Each year Santa Claus brings many gifts for children around the world. When he delivers his presents, he spreads a special magic that brings joy to each precious child. This collection celebrates the wonder of what children call their favorite time of year. 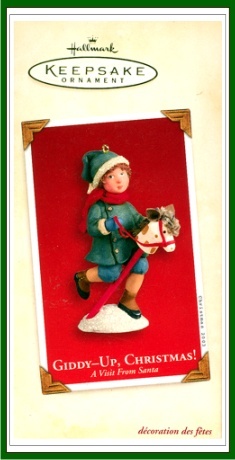 Christmas couldn’t come fast enough for the little boy in his ornament. Santa rewards his patience (and good behavior) with a new stick horse. Ornament is MIB with normal box aging (small crease on side of box). Has Price Tag.